As many people know, on the night of October 10, wildfires broke out in northern California’s wine country, wreaking havoc in Napa, Sonoma, and Mendocino counties. What many people may not know, however, is that the fires are effectively extinguished, and now is actually a great time to visit the region. Though the fires burned across some 210,000 acres, the entire Napa/Sonoma/Mendocino region covers more than 4.2 million acres. Of approximately 1,200 wineries in the region, estimates suggest that fewer than 10 have been destroyed or heavily damaged. So get your wine-tasting shoes on, and get ready to go. Here’s the information you need. The worst damage from the fires was in residential areas of Santa Rosa and in high hillside areas, not places typically frequented by visitors. All roads are now open. That said, fires or not, having a designated driver is always a good idea when visiting several wineries in a day. 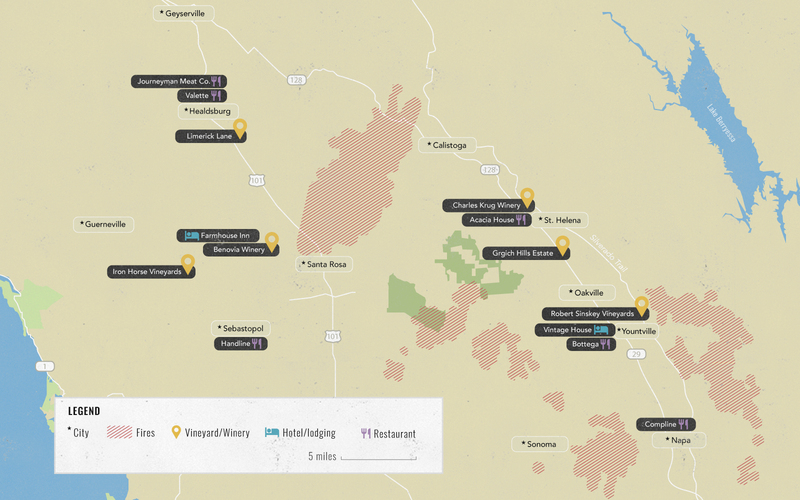 With the exception of the very few severely damaged places, wineries across the region are open and welcoming visitors. In fact, they’ll be thrilled to see you. Too many to count are donating portions of their proceeds to fire recovery funds, and here are a few top picks. Along Napa Valley's Silverado Trail, Robert Sinskey Vineyards is pouring their superb Pinot Noirs; as they note, “The hills behind the winery are a little singed, but if you don’t look up, you’d never know.” Or drop by Grgich Hills Estate, where 100 percent of the tasting bar fees during November are being donated to the Napa Valley Community Disaster Relief Fund. Similarly, Charles Krug Winery, just up the road in St. Helena, is donating 20 percent of all its proceeds during the month of October to the same fund. In Sonoma County, between now and December, Pinot Noir-specialist Benovia Winery near Healdsburg is waiving tasting fees for guests and instead donating $50 for each appointment made at the winery to relief efforts. If you fancy bubbles, head to Iron Horse Vineyards and pick up a bottle of their new Gratitude sparkling rosé — $5 from each bottle goes to the Redwood Empire Food Bank. Or, if big reds are your thing, make an appointment at Limerick Lane to taste their remarkable old vine Zinfandels, and then buy a bottle of their spicy 2014 Syrah/Grenache, 100 percent of the sales of which are going to the North Bay Fire Relief Fund. Throughout the area, hotels are open for business, and hungry for it thanks to cancelations. In Napa Valley, the completely renovated and remodeled Vintage House opened its doors in Yountville only a day or two before the fires. Bad timing, but the property is gorgeous — the 80 bungalow-style accommodations tucked away behind Yountville’s main street feature elegant gray and lavender décor and quiet balconies good for sipping an end-of-day glass of wine, and are steps from top restaurants and wine shops. In Sonoma County, the Farmhouse Inn near Forestville is a serene escape from the world at any time of the year, tucked away off River Road west of Highway 101 (the fires never came near here) five to 10 minutes away from many of Sonoma’s top wineries. The 25 airy rooms offer indoor/outdoor fireplaces and large, jetted bathtubs, and the Michelin-star restaurant is a do-not-miss. Napa and Sonoma’s many great restaurants are all up and running—many of them fed first responders gratis during the fires, but now they are hoping regular business rises back to normal levels. In the town of Napa itself, head to the recently opened Compline wine bar for its eclectic, well-priced wine list and tasty bar snacks (like lighter-than-air gougères and crunchy toast spread with duck liver pâté). 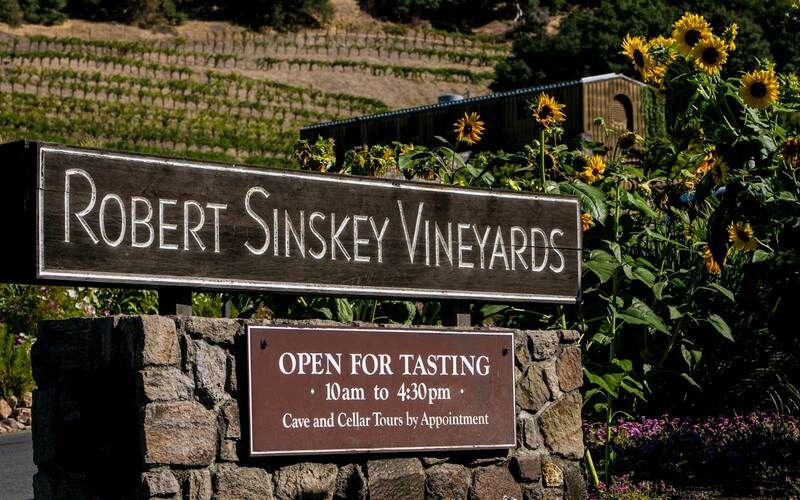 For Sonoma County visitors, the restaurant scene (and the county itself) is wide and varied. In Healdsburg there’s Valette, talented chef Dustin Valette’s eponymous restaurant, which has become a recent star for dishes like his cocoa-nib-crusted Liberty duck breast (ideal with a local Pinot). Or, for a more causal snack, check out the terrific house-made charcuterie at the recently opened Journeyman Meat Co. The western Sonoma area as you head toward the coast is one of the most gorgeous parts of wine country. After visiting a few tasting rooms, stop at Handline in Sebastopol for some of the area’s best-ever fish tacos. Located in a repurposed Foster’s Freeze, it’s a great place to sit outdoors and enjoy the spectacular fall weather. Bringing business to the region right now will only help the local economy, so one of the best things anyone can do is visit wine country and support local businesses. Visitors help offset the continuing economic damage that canceled trips and vacations are doing to livelihoods here. That said, some of the hardest hit areas in the fires weren’t in tourist zones; more than 6,000 homes and businesses were lost, particularly in Santa Rosa. Many of the people who lived in those neighborhoods need all the help they can get right now. Two of the best charities to consider are the Sonoma County Resilience Fund, which is providing mid- to long-term help for those affected and the Napa Valley Community Foundation. Also consider donating to the Heart of the Vine Go Fund Me campaign started by Vintage Wine Estates, which is specifically helping the needs of winery employees and families (as well as first responders) who lost their homes in the fires.